A French official plans to begin mobilizing a global effort — starting with Germany — against tech companies encrypting their messaging apps, according to Reuters. Messaging apps, such as Telegram and WhatsApp, that promote end-to-end encryption, are used by terrorists to organize attacks in Europe, the minister said. Although individual governments have previously explored seeking mandatory backdoors from tech companies, this is the first attempt to unify the case across countries. If successful, it could make it more difficult for these companies to resist the requests. The debate over the use of end-to-end encryption in chat apps recently made headlines after it was revealed that terrorists might have used secure chat apps to coordinate a slew of attacks in France. Law-enforcement officials argue that the highly secure tech impedes their ability to carry out investigations relating to crimes that use the chat apps. Tech companies argue that providing backdoor access to their apps, even to governments, creates a potential vulnerability that can be targeted by malicious players seeking access to users’ personal data. To add weight to this argument, it was revealed last week that a “golden key” built by Microsoft for developers was accidentally leaked. And while the company has sent out patches for a majority of its devices, it’s unlikely to reach those potentially affected. 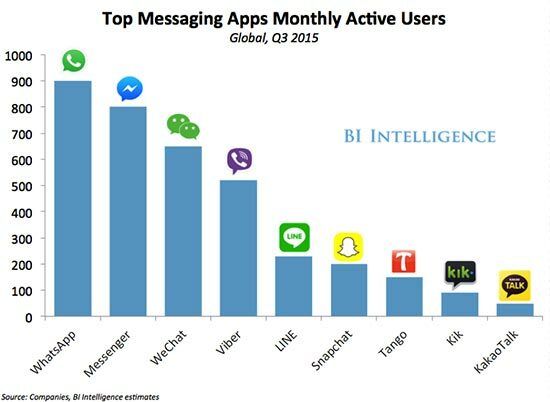 BI Intelligence, Business Insider’s premium research service, has compiled a detailed report on messaging apps that takes a close look at the size of the messaging app market, how these apps are changing, and the types of opportunities for monetization that have emerged from the growing audience that uses messaging services daily.